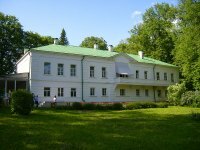 Located 120 miles (193km) from Moscow, Yasnaya Polyana is the estate where Leo Tolstoy was born in 1828. In 1921, the property became a memorial to the celebrated author of War and Peace and Anna Karenina, and contains a museum with his personal effects, including an extensive library of nearly 22,000 volumes. Nearly a century later, the museum is still run by Tolstoy's descendants. Tolstoy spent 60 years living at Yasnaya Polyana with his family, and each of his 13 children were born there (although four died young). He founded a working farm and children's school on the estate, and is buried in an area called the Forest of the Old Order (so called because it was forbidden to cut down trees there). Address: Yasnaya Polyana, Tula Oblast, Russia. Transport: Buses are available from Moscow, stopping in the nearby town of Tula. Opening times: Tuesday to Sunday: 9am to 8pm. Admission: Admission is RUB 100. A guided tour is RUB 350 on weekdays and RUB 400 on weekends. Students and senior citizens are entitled to a RUB 50 discount for admission and for tours.